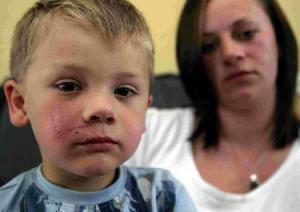 UNITED KINGDOM -- A three-year-old boy could be scarred for life after he was savaged by a dog during a family picnic. 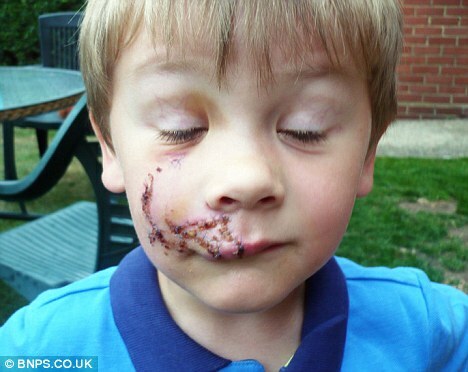 Logan Trim was left with horrific facial injuries when he was mauled by the black Labrador in a park at Poole Harbour, Dorset. The attack was especially shocking as Labradors are known for having an excellent temperament and are friendly around children and other dogs, according to experts. The youngster was left covered in blood, and needed 40 stitches to the wounds on his face after the shocking attack, which happened as his mother bent down to stroke a puppy. The Labrador was not thought to be the puppy's mother. Logan had been at the park with his mother Lara Slingsby, baby brother Eithan and his grandparents when they spotted a woman with a puppy and a black Labrador. 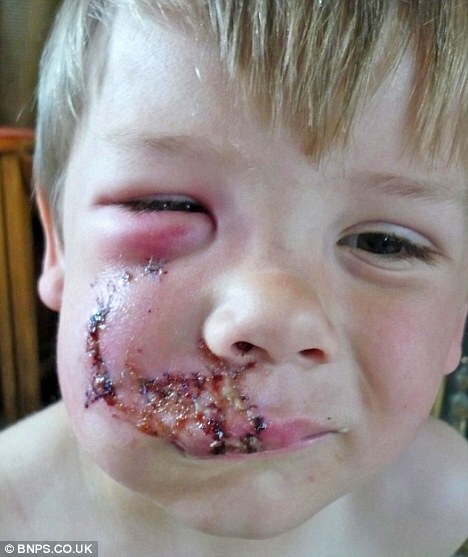 Miss Slingsby had walked over to stroke the puppy when the Labrador jumped on the three-year-old without warning, savaging the right side of his face. The 22-year-old carer, from Colehill, near Wimborne, said: 'The whole thing was just and was like something out of a horror film. 'Logan has had nightmares about it and has woken up saying "bad doggy, naughty doggy". An ambulance was called to Whitecliff Park and his mother tried to stem the blood with Eithan's muslin. Logan was taken to Poole Hospital where he underwent surgery for his wounds. Stitches were sewn into his face from the bottom of his eye to the middle of his mouth, and his cheek swelled to the size of tennis ball. He now faces being scarred for life. Miss Slingsby and her children had gone to the seaside park with her parents, Tricia, 45, and Paul, 46, to enjoy the sunshine. She said: 'We had been in the park for a family day out as it was lovely and sunny. 'We had a picnic and Logan had just got off the swings in the park because his granddad had gone to the car to get his kite. 'We saw a lady sat down about 40 feet away. She had the dog, which looked like a Labrador, and a puppy with her. 'It wasn't a pit bull or a Staffordshire bull terrier that you would think would be dangerous. 'She saw us and smiled so we walked over to her. Logan was a couple of steps behind me. The dog was off the lead and right next to a children's park so I assumed it would be fine. 'I put my hand up to the Labrador dog and it sniffed my hand and then I went over to the puppy. 'I didn't see what happened but Logan wasn't running or shouting and didn't do anything to provoke it. 'The next thing I knew I heard growling and screaming. I looked around and saw Logan lying on the floor. The dog was just getting off him. 'The woman grabbed hold of the dog and started apologising. 'I picked Logan up and took him to the nearest bench. My dad came running over and a lady nearby called an ambulance. 'Logan's face was covered in blood, it was everywhere. His T-shirt was covered in it. He was screaming and he went into shock. 'It was hard because I just wanted to break down, but you don't want to worry them. They know something is wrong if mum's crying. 'He had two big gashes on his lip and another gash below his nose. His lip swelled right up. Miss Slingsby said that the woman owner of the Labrador - which was called Sammy - apologised to the Logan's mother and handed over her phone number. She also said that after the attack the woman owner called a man who arrived minutes later and took the dog away. She said she wants the dog, which is about one-year-old, destroyed, adding: 'You cannot trust the owner to keep it on a leash or a muzzle. A spokesman for Dorset police said: 'On May 31 we received a report from the ambulance service that a child had received a dog bite to the face at Whitecliff park.